I hadn’t intended to join the course. I was just trying to follow the bike path along the Rideau canal. But since I was here, hey what fun to have so many cyclists around me. A woman nipped by, crouched over her tri bars, and I felt my speed pick up as my competitive side kicked in. I think I might have kept going to transition and then racked Monty while I headed out on the run… Until I heard the marshall yelling at me. I guess the multitude of panniers and the bear spray strapped atop the tent bag gave me away as not the true triathlete. Oh well, I better leave the course then. I waited for a gap in the bikes, darted over the road and heaved Monty up the kerb onto the opposite bike path. The triathlon course paralleled the Rideau bike bath for several kilometres. So I got to enjoy watching the triathletes puff past with faces contorted by varying degrees of steely focus and enduring misery. They came in all sorts of shapes and sizes. In triathlons I’ve done in the past I have been on the podgier, slower end. The first triathlon I ever did was also the first time I ever saw a woman with a six pack (!) Yes there were a few people who had entered it for “fun” like me, but the majority of the lean, muscly competitors looked like they lived off a diet of protein shakes and raw tofu. They themselves looked to have a lower fat content than a slice of cucumber. Had I known Ottawa was putting on a triathlon this weekend I would have entered. I am only a pair of goggles and a wet suit short of having all the gear with me, I realised. Plus it would be excellent training for my next challenge. I have decided that my next challenge (post cycling across Canada) will be to do an Ironman triathlon. To be clear, my aim is not to beat the cucumbers with six packs, but rather to get around in one piece. To complete it without major injury. To enjoy myself for at least a moment. To discover whether ordinary folk like me can accomplish such a feat. For though I have currently developed a habit of saying things like “oh it’s only 90km” and can now, as I did this afternoon, whip 60km down the road without braking for a break or breaking into a sweat. I still consider myself to be in the boundaries of normal. As my school friend Beth can attest to, I was never the best at PE in school. I used to walk the cross country whenever the teacher wasn’t watching, I despised the beep test, and I would juggle the bats instead of playing rounders. Thankfully the PE teacher never bothered me much (unlike poor Alex who was berated and told his heart would give out if he didn’t do some exercise). Because each morning the PE teacher would drive past me as I cycled up the hill to school. Today I cycled an enjoyable 130km along the route verte bike path. I enjoyed views of the Ottawa river over the ripening farmland. Big, puffy clouds as big as a mountain range rolled overhead but thankfully the rain held off. My legs pumped effortlessly up the inclines. With each kilometer my speed increased. Was it the effect of seeing the triathletes this morning? 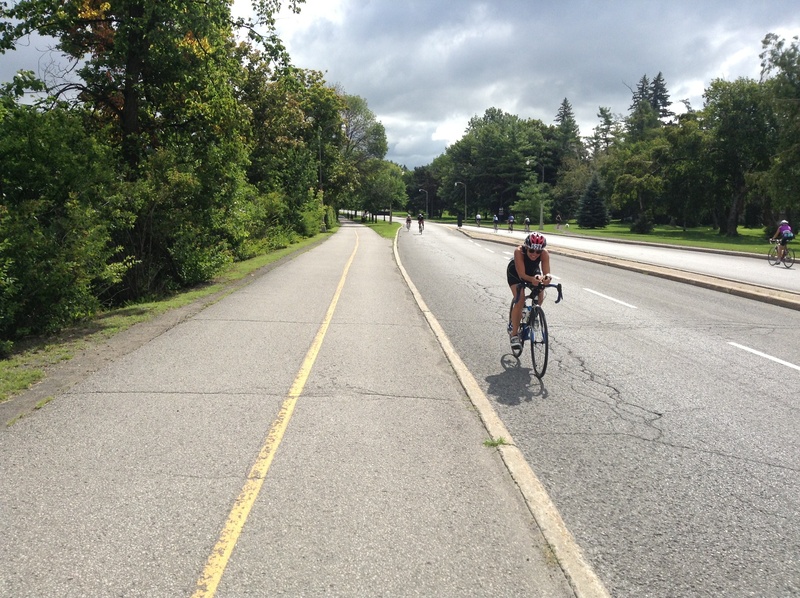 I laughed at the vision of Monty and I taking part in the Ottawa triathlon, laden with tent and panniers. But who needs that puny 40km time trial when I have all of Canada as my bike course?